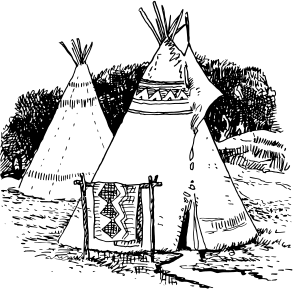 DryStoneGarden » Blog Archive » Tepee? A few months ago, I mentioned that the US Census had sent out a form for our tepee. No one, of course, resides in the tepee; we said zero occupants and mailed it back, but then I guess the census was left to wonder who had filled out the form if no one was living in it. They’ve now sent two separate workers to verify that there really is no one living in it. I suppose a tepee does sound like it could be the home of an anti-census militia activist. Neither of the census workers spoke enough English to even know what a tepee was, and until this weekend we hadn’t found time to put it up yet, so we’ve had some rather long and involved conversations to explain the situation. In a couple of weeks some friends will be coming to visit; we have to just hope the census doesn’t send out a third worker while we have people in the tepee. This entry was posted on Sunday, July 25th, 2010 at 11:16 am and is filed under miscellaneous. You can follow any responses to this entry through the RSS 2.0 feed. You can leave a response, or trackback from your own site. Pretty funny in a way. Hopefully a human is on the other end of your census form and can put “zero” and “teepee” together and not hassle you with a visit. Are there any tree houses or garden gazebos in your neighborhood that got census forms too?